(based on videos posted with that title), half a million by “Gangnam Style,” and a stunning 1.5 million videos by“Harlem Shake” (that’s a lot of motorcycle helmets). These inspired riffs got us thinking about those magical moments when songs become bona fide trends—and people all over the world start remixing, covering, parodying, dancing, and lip-dubbing. So to celebrate this year, we pay homage to the music you've made on YouTube. We got a bunch of your favorite performers together to cover some of the most memorable musical moments in YouTube’s history. The result is a mashup called YouTube Birthday Karaoke Night, featuring familiar faces like The Gregory Brothers, Chester See, Cimorelli and more (see if you can spot all 18). Now raise your Cups ... ’cause Here it Goes Again. Call us Maybe? Claire Stapleton, YouTube Culture & Trends, recently watched (and crooned along to) the playlist Nine Classic Hits Celebrating YouTube’s Ninth Birthday. Trololo! YouTube turned 9 this May. And what multitudes are contained in that vast near-decade of video? To call out just a few highlights in YouTube history, there are more than 120,000 videos inspired by “Let it Go”(based on videos posted with that title), half a million by “Gangnam Style,” and a stunning 1.5 million videos by“Harlem Shake” (that’s a lot of motorcycle helmets). These inspired riffs got us thinking about those magical moments when songs become bona fide trends—and people all over the world start remixing, covering, parodying, dancing, and lip-dubbing. for “YouTube OnStage Live from the Kennedy Center,” a celebration of art, technology, and culture that unites stars who are building global fan bases worldwide on YouTube. Whether it’s the vintage cover artists Scott Bradlee & Postmodern Jukebox, or the Playing for Change movement that helps connect the world through music, all the performers featured in the event have found a global platform and audience for their creativity on YouTube. Visit the Kennedy Center’s YouTube channel for the full rundown of the night, artists’ videos, and a replay of the event after it airs live. And if you’re in D.C., head down to the Kennedy Center for free tickets this evening. Ali Rivera, West Coast Head Artist Label Relations, recently watched "Dude, what? This ramen sucked." Nine-time Grammy Award winner John Legend. Dubstep violinist Lindsey Stirling. The most popular dancers on YouTube, Les Twins. On their own, these artists have topped charts, gone platinum and generated more than a billion combined views on YouTube. This evening, the John F. Kennedy Center for the Performing Arts in Washington, D.C. will host these artists and more to perform on its iconic stage. Tune-in today at 7:30 p.m. ET at youtube.com/TheKennedyCenter for “YouTube OnStage Live from the Kennedy Center,” a celebration of art, technology, and culture that unites stars who are building global fan bases worldwide on YouTube. video, a run-down of what we’re working on to make YouTube better for you. We’ll be doing this regularly, so you can stay informed on where we’re headed. These features will join a few recent updates, including new comment management features, a way for artists to share in revenue from eligible cover song videos, and our ever-expanding Creator Academy. Now, we want to know what you think of what we’re working on. Share your thoughts with us on Google+ or Twitter—we’ll be reading, responding and using your feedback to help make these upcoming launches even better. Matt Glotzbach, Director of Creator Product Management, recently watched (what else?!) the Creator Preview. Twice a year in our global satisfaction survey, we ask you how we’re doing on a range of topics. Our most recent survey included a question about the top ways we could do a better job keeping you informed about what’s happening at YouTube. Your biggest request? You want to hear about the new stuff we’re working on ahead of time, so you can tell us if we’re heading in the right direction. Well, your wish is our command. We’ve put together our first Creator Preview video, a run-down of what we’re working on to make YouTube better for you. We’ll be doing this regularly, so you can stay informed on where we’re headed. For their Mythical Show series, Rhett & Link use the naming convention “The Mythical Show - Ep.# (Feat. Guest)” to establish that each video is one episode in a larger series. Viewers can quickly see that all of the videos are related, just by looking at the thumbnails. Tastemade starts each episode with the show’s title “Thirsty For...” overlaid onto the drink of the week, and ends with a preview of the following week’s recipe. Every drink is different, so each video has its own unique typeface and music, but the consistent format binds them together into a single branded series. Tati has a weekly segment titled Tip Tuesday, building her weekly upload schedule into the name of her show. At the beginning of each video, she lets viewers know that they can come back every Tuesday for new episodes. 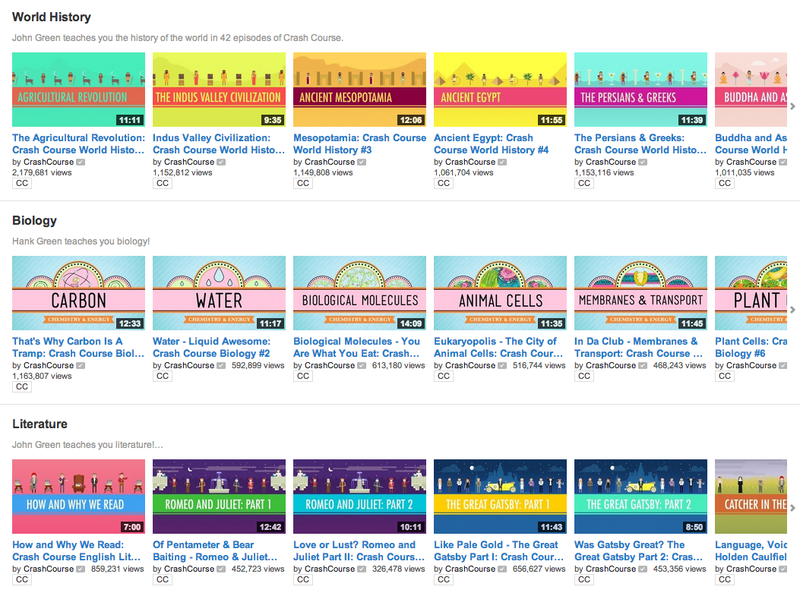 Crash Course lays out their educational shows in ordered playlists on their homepage. Each show occupies its own channel section for easy browsing, and the viewer just has to click “play” to start a series from episode one. For more tips on developing your creative strategy (and much more), visit the Creator Hub.